Sky News Tory Election Bias - Will Adam Boulton Lose the Plot Again? Sky News, the Murdoch owned Britain's version of Fox News revealed its true colours during and immediately after the 2010 General Election as its presenters became increasingly desperate in their attempts to steer the post election agenda towards a Conservative LIb-Dem Coalition as opposed to the then possibility of an Labour Lib-Dem Coalition. 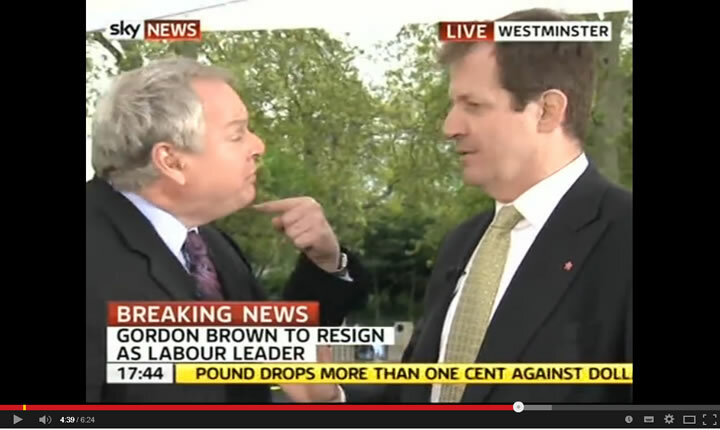 This video takes a look beneath the Sky News mask of impartial news reporting as sky news presenter Adam Boulton literally loses the plot at the prospects of a Labour Lib-Dem deal (10th May 2010). So when you watch sky news remember that there is a subtle bias towards the Tories, maybe nowhere near as blatant as that of Fox News bias towards the Republicans, but if you pay attention you can catch glimpses from beneath the mask. "Do you think this election is a choice between chaos and competence?" Voter - "I think that's the line they try and bring out now and then, its too simplistic to see it like that"
Boulton - "Do you think if there was a labour led government it would be more chaotic and less competent than a Tory one"
Voter - "I don't think that's necessarily the case, I think they like to think that is the case but Labour is more for the people, for the lower classes..."
Boulton - "Do you think people are beginning to say that we don't need a change." And on Boulton continues with Sky News pro-tory election bias.